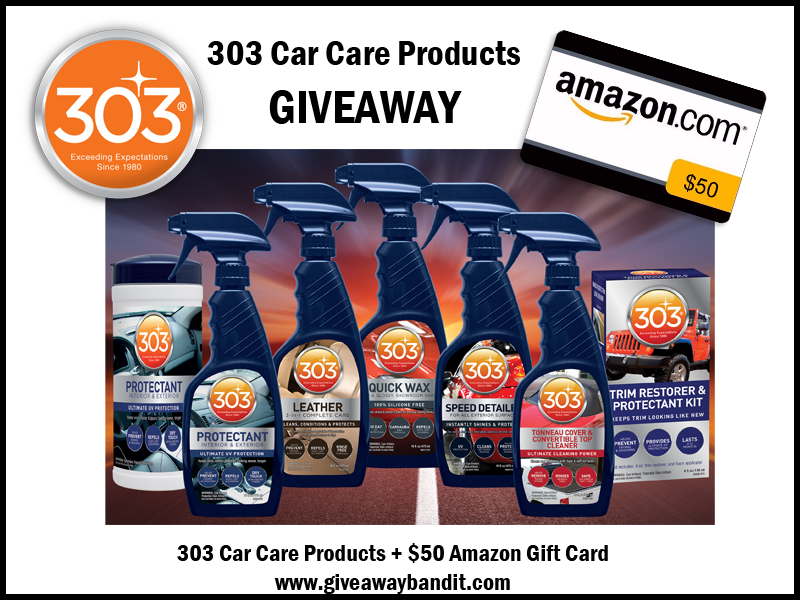 To celebrate National Car Care Month we have teamed up with 303 Automotive Appearance Care Products to give away a prize package! Keep you car clean and protected with 303. Read our 303 review: 5 Tips to Keep Your Car Clean and Protected. 303® Protectant – offers superior protection of your vehicle’s interior and exterior surfaces against the harmful effects of UV rays. It brightens all vinyl, rubber and plastic to keep it looking new, longer. It also helps prevents fading and cracking, repels dust, lint and staining and dries with a non-greasy finish. 303® Protectant Wipes – offer a convenient and portableversion of 303 Protectant. Each container includes 40 individual wipes perfect for quickly brightening up vinyl, rubber and plastic surfaces. 303® Speed Detailer – instantly shines and protects clear coat, fiberglass, plastic, chrome and glass. It blocks the sun’s harmful rays, helps protect against fading and keeps your vehicle looking clean between washes. 303® Leather – is a 3-in-1 complete care solution- it cleans, conditions and protects. It is safe to use on all finished leather and vinyl and helps prevent fading and cracking, reduces dust, lint and staining and is a rinse free formula – just spray on, and wipe off. 303® Instant Windshield Washer Tablets – Eco-friendly andsuper concentrated tablets deliver three times the cleaning power of regular windshield wiper fluid. Simply drop a tablet into your cars reservoir and add a gallon of water. No disposal of plastic containers required and the powerful solution removes bugs, dirt and grime to make your windshield sparkle. Giveaway is open to the US only, ages 18 and older. Giveaway ends April 30, 2016 at 11:59 pm EST. Enter to win via the giveaway form below and good luck! Disclosure: We reserve the right to make revisions, to cancel, or suspend this contest for any reason. We are not associated with any of the companies named above. The odds of winning are based on the number of entries received. Giveaway is open to US and Canada,18+ only. Confirmed Winner(s) (by Random.org) will be contacted by email. Winner(s) have 24 hours to respond before a new winner is chosen. No purchase necessary. Void where prohibited by law. The sponsor(s) will be responsible for product shipment to winner(s) of this giveaway. The Bandit Lifestyle and any other blog participating) is not responsible for product shipment/delivery. This event is in no way administered, sponsored, or endorsed by, or associated with, Facebook and/or Twitter, Google, Pinterest. This disclosure is done in accordance with the Federal Trade Commission 10 CFR, Part 255 Guides Concerning the Use of Endorsements. Entrants must only enter with either one email address, IP address and/or Facebook account, anyone found violating these rules will be disqualified. It is at the sole discretion of the admin of the giveaway if the winner has met the rules or not. I want to try the 303® Protectant Wipes, they look great and convenient to use. I would love to try the 303® Multi-Surface Cleaner to clean the insides of my car! I want to try the 303 Protectant Interior and Exterior! Looks like great products for my car! I’d like to try the speed detailer. Oh so hard to choose! I think I would first try the 303® Instant Windshield Washer Tablets! I’d most like to try the 303® Leather on the interior of my vehicle. I’d like to try the Quick Wax! I would try the leather cleaner for the interior of my husband’s car. I love how leather smells when its been cleaned.